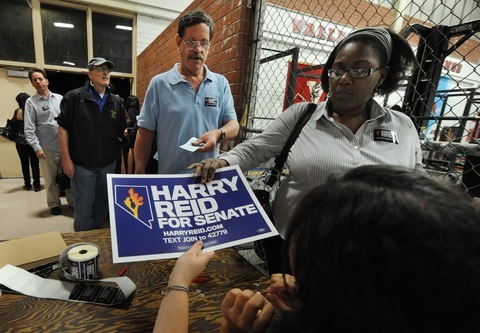 LAS VEGAS | In the Silver State’s closely watched Senate race between incumbent Harry Reid and Tea Party favorite Sharron Angle, supporters on both sides of the spectrum voice deep concern over the state’s hard-hit economy. After four days on the ground in Nevada following what could be the nation’s most-watched Senate race, I came away with a sense that the prognosticators are right about the passion in the Tea Party movement in this recession-weary state. But they may also be underestimating the passion of other segments of the electorate. The big story in the Silver State is Senate Majority Leader Reid’s battle to hang on to his seat for a fifth term. Because of the devastating effects of the economic downturn on Nevada — a 15 percent unemployment rate in Las Vegas and the highest state foreclosure rate in the country — Reid was viewed politically as a dead man walking. At least that was the case until June when Republicans nominated former state assemblywoman and Tea Party favorite Sharron Angle of Reno to run against him. But anger at Washington for not fixing the economy, and at Reid for his support of the president’s agenda, runs deep in this state. Even though Reid has flooded the airwaves with paid TV ads on Angle’s “extreme” positions, the majority leader hasn’t been able to secure a lead. With just two weeks to go, the race is neck-and-neck. Having seen the polls and read the stories, we arrived expecting to find a vigorous anti-Reid electorate. The picture on the ground was more mixed. In our random hunt for voters, the passion seemed as real on the left as it was on the right. And all the voters we spoke with said they planned to vote. But lest we jump to conclusions, we heard a cautionary note as well. D. Taylor, president of the local Culinary Workers Union, which represents thousands of cooks, waiters and others who are the backbone of much of the entertainment industry in this tourist-dependent state, believes Reid would do far more for Nevada and his members than would Angle. He said this is by far the toughest political environment he’s ever experienced.